If you read my recent columns on the MESSENGER spacecraft and its crashing into the planet Mercury, now is the time to see where it all happened. 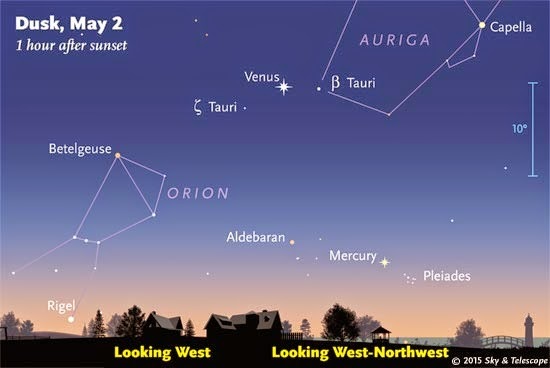 Mercury is visible in the Western sky about an hour after sunset and will be for the next week or so. The key to finding Mercury is having a western horizon view that is clear of trees and buildings. Binoculars will help immensely in your search as will this diagram below. Make sure you find Mercury and not Aldebaran. Mercury will be more yellowish-white in color while Aldebaran has a reddish-orange color. When you look at Mercury say a "thank you" to MESSENGER for the great data and images returned by the plucky spacecraft. It crashed on April 30th after running out of fuel and made a new 52-foot wide crater.